Prepare for a unique experience at the Alfred Ford School of Management. Learn with other leaders in today’s business and conscious-leadership arena. 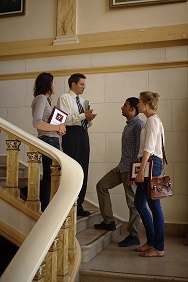 Thinking about continuing your education in business on the Master’s level? Do you want to inspire and foster transformation and bring out the best in those around you, while applying the latest business principles? Do you prefer focusing on "us" rather than "me"? Then you are in the right place! 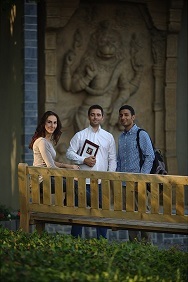 Alfred Ford School of Management offers an MBA with an emphasis on conscious leadership and management. The school develops future leaders with a global mindset and impeccable character. Conscious leaders understand that a successful business serves the purpose of the company, supports its employees, and creates value for all stakeholders. They consciously develop a culture of care and trust. At the Alfred Ford School School of Management, you will develop the skills and outlook that will turn you into a completely different kind of businessperson. The education will professionally and personally transform you and make you a leader. A conscious leader. 18 months online MBA. PROGRESSIVE CURRICULUM Our curriculum is tailored to put you in the shoes of executives at real companies. FIRST-CLASS ONLINE LEARNING We provide a wide range of study resources that become available to you at the click of a button. MOTIVATION TOWARDS INNER TRANSFORMATION We guide you to look inside yourself, focusing on deeper self-knowledge so you can leverage your strengths as a leader. FLEXIBILITY IN STUDYING SCHEDULE Through the captivating online study platform, the classroom comes to you at a time that really suits you. INTERACTIVE WAY OF DELIVERY Alfred Ford School of Management approach to learning is unique not only in its flexibility but also in its delivery. INTERNATIONAL AND PROFESSIONAL FACULTY Carefully selected tutors come from six continents with many years of teaching or professional experience in their respective fields. COMMITMENT TO DIVERSITY Students and faculty at Alfred Ford School of Management come from dozens of countries and from every sector and industry. Alfred Ford School of Management gives you the opportunity to go where other MBA programs don’t go, from the innermost drives of your own behavior to the broadest possible perspectives on business and its place in society. Alfred Ford School of Management sets high but reasonable standards for its applicants. The candidate has to have a higher educational degree, non-standard academic qualifications with business experience, and English proficiency. The tuition fee of €6,950 includes online library access, online campus access, graduation fee, the online modules, and the dissertation supervision. The residency module costs €950 and includes seven days of accommodation, restaurant meals, and additional expenses (e.g. an excursion or a short trip). The mandatory textbooks are not included in the tuition fees; the total price of these varies and is approximately €400. A flight ticket to Belgium (or any other possible residency destination), transport from the airport to the place of residency, and the visa are to be paid additionally. For a one-time payment, we offer a discount of €400 euros. Learning with case studies from Alfred Ford School of Management on Vimeo.